A tree protection plan isn’t just beneficial to the trees that are being protected. It’s also a way to beautify our surroundings while providing quantifiable benefits to the environment. What’s more, a tree protection plan is in many locales an absolute requirement, especially in situations involving ongoing construction and other potentially disruptive events. At Urban Forest Pro (UFP), we’re proud to be one of Portland’s Local Tree Care Providers. That means UFP is licensed, has completed a Local Tree Care Providers Workshop, and has no tree code violations within the past year. Contact Urban Forest Pro today to speak with a certified arborist about how best to generate a tree protection plan that works for you and your property. Tree protection plans, developed by a certified arborist, should address these factors and then put forth a solution that best meets the needs of the property owner and the property itself. For example, a proper plan will protect the tree during construction by preventing any part of the tree from coming into contact with equipment or construction materials. 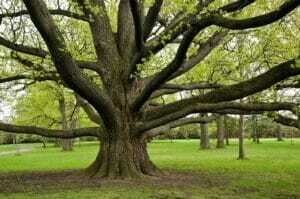 This will minimize disturbances to the while also ensuring that the tree’s soil and roots remain intact. Prescriptive Path: This involves the establishment of a root protection zone designed to keep construction activity away from that zone. In Portland, city code requires a root protection zone to encompass “a 1-foot radius from the center of the trunk per inch of tree diameter.” Thus, a 24-inch diameter tree requires a 24-inch radius root protection zone. Performance Path: This method of protecting trees from the adverse effects of construction and other disruptions is a modification of the Prescriptive Path. Generally speaking, there are alternative measures that can be employed if and when it’s considered impractical to establish a root protection zone. But there are a few standards that still apply. For example, in the city of Portland, an arborist could prepare an alternative root protection method after examining the site and the tree. In lieu of a root protection zone, measures must be in place to provide “an adequate level of protection, based on the findings from the site visit.” Furthermore, the tree must still be designated as protected with the installment of fencing and signage. Urban Forest Pro is a full-service tree-care company. Every member of UFP’s tree-service crews — from salespeople to the arborists in the trees — has been certified by the International Society of Arboriculture. So when we put together a tree protection plan, you can be sure that it’s backed by data, experience, and expertise. The best way to stay on top of these regulations is to partner with the certified arborists at Urban Forest Pro. Contact UFP today to get started on a partnership that gets the job done while still protecting our beautiful urban forest canopy.